Gabriel began her life (on February 28, 2012) at OwyheeStar. 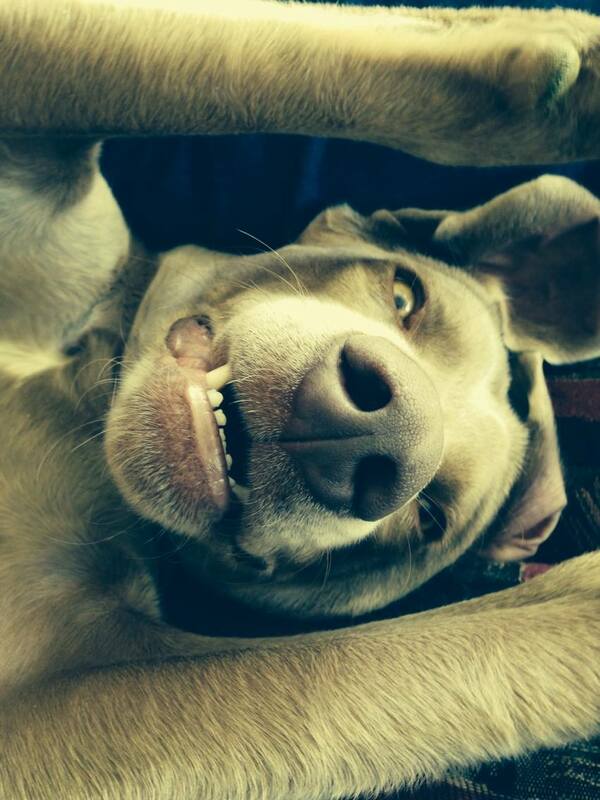 She was one of seven pups born to Livee’s litter (which was sired by OwyheeStar’s Once In A Blue Moon). Some of her littermates have made an OwyheeStar Blog News appearance; none more than the amazing Maizie. There are some other pups from the same parents; however, they were born a year later. Possibly, the most famous of these lives in Idaho (Charlie Blue). Gabriel was the first blue to arrive in Russia. She traveled via courier and arrived safely. Of course, there was a huge adjustment period after the relocation. Nevertheless, she came through and shines bright. The judges like her beauty and conformation. Two participations and two positive outcomes. You can read more on Igor’s website (click here )! We look forward to hearing more about Gabriel and her successful offspring– The Blue Girl O’Hara which netted the BJB (Best of Junior Breed). CAC ( National Dog Show Certificat d’Aptitude au Championnat. Your dog will need 1-6 CAC certificates to become a National Champion. The number depends on the country of issue. CACIB ( International Dog Show) Certificat d’Aptitude au Championnat International de Beaute. Your dog will need 2-3 CACIB certificates which are highly compatible in order to become and International CH. case it is really cold. He was none-too-pleased with my efforts, so I had to take this photo of his reaction. His facial expression cracked me up. Just thought I’d share a funny story from Saturday with you. We have chickens and occasionally we’ll crack an egg for Graydon as extra protein or a treat. On Saturday, I accidentally left a couple of eggs sitting in our sun room where we keep our dog beds. I came back to find only one egg sitting there and Graydon looking a little guilty. I asked him where the egg went, and he just looked even more guilty and hung his head. Upon further inspection I found he had picked one up and hid it on the other side of his pillow on the hard tile floor. Sure enough, it was undamaged and when I picked it up and showed it to him he REALLY looked guilty. 🙂 He sure has a soft mouth. (Speaking of the chickens) It did us take some time for us to train him to leave them alone. We’ve caught him carrying them around in his mouth a couple of times, but they’ve never been hurt. A couple of weeks ago I found Graydon with a freshly killed chicken. I couldn’t believe it! I scolded him but still found it hard to believe he had done it. Later that day I realized it was our dachshund who was the culprit (caught her chasing the chickens) and that Graydon had probably been trying to “rescue” the bird from our incorrigible little wiener dog. Lazy dog days of summer coming to an end. We’ve always wondered what Winnie does with her days when we are not home. We know that her and Max (our 6-year-old Chocolate Lab), play, but seeing her sunbathing was a site to see. I was excited to be able to capture it and, of course, I shared it on Facebook for everyone to see. Many times we take them separately. In this way, we can have invaluable one on one time with them. Winnie is also learning how to bird hunt and perfect her pointing skills. I love capturing her different puppy stages as she gets older (she’s eight months old). I can’t wait to see what she has I store for us in the adventure of our lifetime together. Winnie has changed our world, and we love her to the moon and back. Many thanks to Ray and Nancy for all their updates. They love their OwyheeStar boys; this is Cooper (upside down). He is a happy and busy boy. He runs many miles, hikes, walks, and retrieves birds. He is excellent in the water and chasing upland birds. His primary job is to be a lover-boy. We think you know what we mean. Hope all is going well for you guys! I thought I would write you a quick email letting you know how Jager has been. What a sweet boy he is! I still can’t get over how good of a disposition he has. I have never seen my vet gush over a dog so much. It was pretty funny actually how he was about Jaeger. He (literally) got all the girls in the office to stop and watch him walk back to the exam room one time!) 🙂 Besides his great looks and sweetness, he has been doing great. My German Shepard Sophie just loves him, and they play nonstop when he is outside. Adam has been working with him a lot. We have a big pond near our house that Adam likes to take him to train. It’s perfect training ground for the little guy. He got extremely birdy a couple weeks ago which only made Adam even more proud! We couldn’t be happier with him! We have always preached the importance of achieving the water retrieve. Some folks never achieve it, but if you get on it early and stick with the process, your Weimaraner can swim too. The hiccup happens once the adversity to water, or the idea that they don’t swim is ingrained. We can still hear Ray asking us if Cooper would swim, and retrieve ducks. We think that question has been answered. Here is Cooper doing his water work. 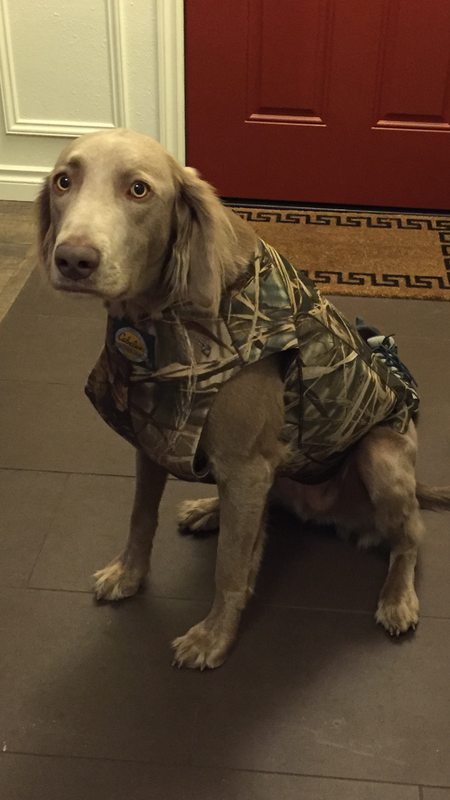 A true versatile Weimaraner is more to the family than an all-purpose hunting dog. Nancy and Ray have a multi-facet life of the best kind. Gus (the old guy) and Cooper join them in nearly aspect; they don’t travel to the tropical vacations. Nonetheless, they spend a lot of time hanging out, and doing grand stuff. Nancy is a dedicated runner with a closet full of ribbons, and medals. You know what I mean. She gets it done. These guys have joined in her during training. Ray and Nancy can be seen hiking, and involved in community projects. Almost always (when appropriate) you will find the Weim kids with them. Hunting, hiking, traveling, exercising, and resting are done together. Here are a few of the most recent moments when they took the time to capture a photo of their adventure. We send you (Ray and Nancy) a huge thank you on every level. We are blessed to know you, and to share our love of this breed with a family like yours.